The Methodist Episcopal Church of Walnut Township had its birth in a log cabin owned and occupied by Isaac Reager and family where he and his neighbor, Ransom Bishop and wife, made arrangements to hold services in their homes alternately. This was in the spring of 1855. The meetings were conducted most of the time by "exhorters." Winterset, at the time, was a mission under the care of Rev. Richard Swearingen, who came out to Walnut Township on occasion to preach. On August 16, 1855, he organized the little company of Walnut Township worshippers, 16 in all, into the "Reager class" with Isaac Reager as leader. The charter members were Isaac Reager and wife, Mary Sutherland Reager; Mrs. Jane Gregory; Joesph Quinn and wife; Mary Quinn; William Quinn; Andrew Reager and wife Orpha Gregory Reager; Joseph Reager and wife Rachel; Fanny Baker; Polina Vorse; Hamilton Reager; and Abram Compton. In 1856 the Reager school house was built and the preaching moved from the homes to the school house. A Sunday school was organized the same year and Andrew Reager was elected superintendent. Joel Mason was the preacher in charge of the Brooklyn circuit, Brooklyn being a small village 1 1/2 miles south of Peru. There were eight regular preaching points on the Brooklyn circuit in 1856, which embraced all of Madison county south of the Middle River and also included New Virginia and Irish Grove in Warren county and Lapart and Green in Clarke county. There were about 170 members on the circuit. Preachers included John S. Jordan, David Worley, John W. Guiberson, L. W. Smith, and Bazel Shepherd. Exhorters were Robert A. Mathews, Isaac J. Knotts, Norval S. Allcock, John Moore and Jacob Haskel. In 1857 a church and parsonage were built east of Brooklyn and the name of the society changed to the Ohio circuit, a name retained until 1885 when it was changed to Peru. The Elm Grove class is the oldest in the circuit, having been organized in 1863 at the home of Norval Allcock while he lived where Hanley is now located. 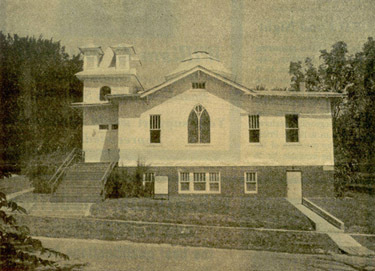 In 1867, a new church was built and named the Elm Grove church. In 1881 a small frame building in Peru belonging to the Adventists was purchased by the Reager class. They held services in that until 1885 when the new church was built. The Methodist Episcopal church of Peru was built in 1885 at a cost 0f $1,400. 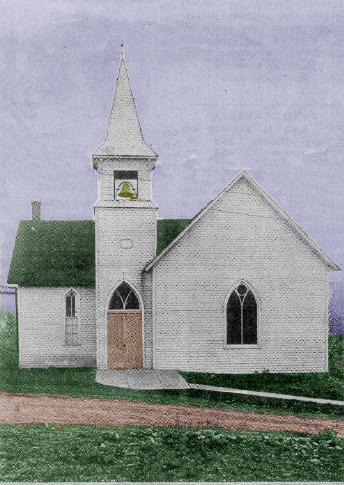 When the Great Western Railroad bypassed Peru in 1894, the church, along with many other buildings, was moved to East Peru, about a mile from the original location. The old church was remodeled into a house in 1915 when a new church was built on Peru's main street. The large arched stained glass window shown on the facing wall in the photo to the right was preserved in the new church. The following is a list of church elders who served the Peru congregation from the beginnings of that parish in 1885 to 1915 when the newer Methodist church was dedicated: J. B. Hardy, J. G. Eckles, James M. Holmes, M. D. Collins, J. W. Vincent, S. C. Rhyman, V. C. Martin, James W. Webb, J. H. Sesseney, W. W. Reece, E. M. Holmes, Dr. Miller, G. W. L. Brown, and A. E. Slothower. Shown at the right is the replacement church built in 1915. This page was created on Dec 11, 2006. This page was last updated Thursday, 19-Jan-2017 18:06:50 EST .